A catastrophic earthquake in China releases mutated viruses from a research institute, a global pandemic ensues and causes the breakdown of civil order. Faced with a complete failure of communications, power and water supplies, and surrounded by devastation, isolated survivors must defend themselves or attack others for the little that they have. 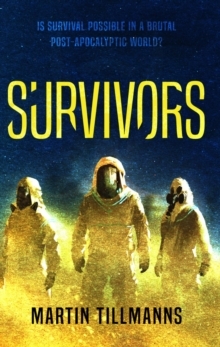 Survivors follows the Morton family in their effort to cope, their anxieties, mistakes and fortitude in the necessary struggle to become survivors. Readers are taken from an isolated refuge in the Peak District to the chaos of central Manchester as they follow the family in their attempt to build a self-sufficient survival group. When the young women in the group are abducted, Tom Morton begins a desperate search through the Lake District to find his daughter, Jo. Racked with guilt and self-doubt, Tom knows that the search can only end in violence while Jo endures a solitary and hazardous trek across Northern England, revealing hidden depths of resourcefulness. Both are on journeys of self-discovery: can they truly survive in this brutal post-apocalyptic world?Inspired by the work of John Wyndham, Martin Tillmanns' debut novel will appeal to readers who enjoy realistic apocalyptic thrillers.